KINGSFOLD, West Sussex, England, February 15, 2011 (ENS) – Rising demand for powdered rhino horn in Vietnam and China has driven the price as high as US$50,000 per kilogram, roughly equal to the street price for cocaine in the UK, says a international wildlife conservation organization headquartered in the hamlet of Kingsfold, West Sussex. Mark Jones, programs director at Care for the Wild International, says increased demand and high prices have led to a renewed surge in rhino poaching. Rhino horn is used in traditional medicine to treat anything from headaches to fevers, rheumatism and gout. 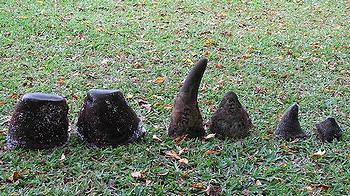 Recent claims by a Vietnamese official that he used rhino horn to cure his cancer have escalated demand, says Jones. South Africa alone, which is inhabited by 70 percent of the world’s remaining rhinos, lost more than 330 animals to poachers during 2010, almost three times the previous year’s losses, and 30 times poaching levels in the 1990s. Another 21 rhinos were killed there in January this year, says Jones. On January 31, the South African Press Agency reported that two Vietnamese hunters with permits to hunt rhino near Musina were caught allegedly trying to smuggle four rhino horns out of Limpopo. While the hunting was legal, the removal and transportation of the horns constituted an illegal act. Populations of rhinos in other African countries also are being affected, with poachers using sophisticated equipment such as helicopters, modern veterinary drugs, night-vision goggles, and high caliber weapons. Poachers are using aircraft to hunt rhinoceros, Zimbabwe’s wildlife chief said February 1. Seven endangered rhinos were killed in southern Zimbabwe in December and January, said Parks and Wildlife Director General Vitalis Chidenga. Reports from India suggest that beleaguered populations of one-horned rhinos in Assam are also being targeted, with horns being smuggled across the poorly protected border with Myanmar, also called Burma. The authoritative IUCN Red List of Threatened Species classifies the white rhinoceros, Ceratotherium simum, as Near Threatened with extinction. The black rhinoceros, Diceros bicornis, is listed as Critically Endangered. Throughout most of the 20th century, the black rhino was the most numerous of the world’s rhino species. Relentless hunting of the species and clearances of land for settlement and agriculture resulted in the population being reduced from a probable several hundred thousand at the start of the century, to less than 2,500 by the early 1990s. The greater one-horned rhino, Rhinocerus unicornus, is considered to be Vulnerable. The IUCN’s African Rhino Specialist Group has a policy of not releasing detailed information on the whereabouts of all rhino populations for security reasons. The populations of all three species now are increasing slowly, according to the IUCN. 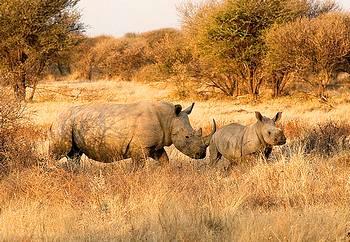 By 1977, all international commercial trade in rhinos and their products was prohibited under the Convention on International Trade in Endangered Species. However, following a continued increase in numbers, in 1994 the South African population of southern white rhino was downlisted to allow for trade in live animals to “approved and acceptable destinations” and for the continued export of hunting trophies. In 2004, Swaziland’s southern white rhinos were similarly downlisted. 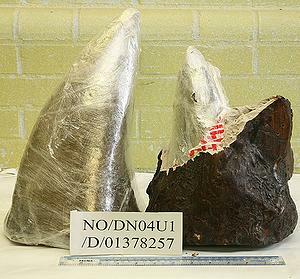 In September 2010, the British government placed restrictions on the export of antique rhino horn objects and trophies, concerned that these items were being auctioned off at high prices and exported for grinding down and sale as powdered horn in the Far East, fueling the rhino horn trade. “The government is committed to protecting endangered species, and in order to do this it has become necessary to take steps to refuse future applications for the export of rhinoceros horn,” said Benyon. Care for the Wild International today called for immediate action to save rhino populations from extinction at the hands of poachers. “We need better protection for the remaining rhino populations. More and better trained and equipped park staff are urgently required. Border security needs to be tightened up. Loopholes in national and international regulations need to be closed to prevent poachers posing as trophy hunters and exporting “trophy” horns for sale,” Jones advised.